Add more ing to your life | Laugh, Sweat, Love and be Vegan! Laugh, Sweat, Love and be Vegan! This past Saturday, September 24th, I drove down to San Francisco to attend a lecture and book signing by the amazing and glorious Gabrielle Bernstein!! She just came out with her new book Spirit Junkie. I can’t even begin to tell you how excited I was to be able to meet her! I discovered her by discovering her book Add More ~ing To Your Life a couple years ago, and totally fell in love with her and her whole philosophy on life. She implements lots of meditations and small steps towards forgiving yourself and loving yourself to get passed all the s#!t that’s blocking you from doing what you love. It was so great to hear her speak in person, and I was definitely a bit star struck, which always seems to happen when I meet someone I admire. So much so that I totally froze when I got up to the table and all I could say was “I think you are amazing, and thank you so much!” then sheepishly walked away… totally forgetting to ask if I could take a picture with her! DOH! I got so inspired hearing her speak, it totally made me want to re-evaluate myself and my priorities with everything that’s going on, as well as my attitude towards them. Since moving to Northern California and into an extremely rural teeny tiny town, where I am living for the next ten months, I have found it to be a bit more of a challenge then I had anticipated. I knew it would be hard adjusting to a much much slower pace of life, but I didn’t think it would be quite as difficult as I am finding it to be. Coming from a busy, political, fast paced city such as Washington DC I have found myself getting bored really easily and frustrated with how slow things were evolving at work. Things have picked up a lot though in the past week so I’m much happier with that, I work much better when really busy! But overall, hearing Gabrielle speak, and hearing her confidence in who she was and how far she had come from the old her, which part of me related a great deal to, I decided to get my own spirit junkie on, and deal with a few of my own demons that were beginning to bubble up again. I am so excited to dive into this new book!! I’m sure I will be posting more about it as I get further into the book, spouting her words of wisdom. 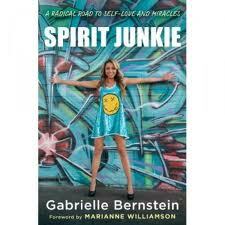 Posted in Life, Review, Uncategorized and tagged Add more ing to your life, Gabrielle Bernstein, Spirit Junkie. Bookmark the permalink. How to Cope with the 6 letter word of death!